Modern Mechanical Careers - Join the Winning Team - Best Place to Work 2017 WBJ! Now Hiring HVAC Techs & Installers! Best Places to Work Washington Business Journal! Signing bonus commensurate with experience! Our employees enjoy competitive pay, comprehensive benefits and work life balance! Modern Mechanical is always looking for motivated and skilled employees to join our growing company. If you’re someone who is dedicated to delivering superior customer service and helping families achieve the best in home comfort, we want to talk to you. We believe our employees are our greatest asset, so we invest heavily in ensuring we have the best team possible. 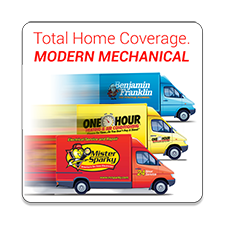 Think you’ve got what it takes to help us accomplish our mission, to deliver the best home mechanical systems service in Northern Virginia? We encourage you to learn more about us and apply today! Provide a well-stocked and professionally maintained service vehicle. Benefits Medical Portfolio includes: Health; Dental; Vision and Prescription Drugs. Bonus Incentives for Journeyman and Masters. Annual Performance Reviews with Bonus Incentives. Uniforms provided through a professional uniform service company. Professional Tool account program that helps you buy the tools you need. One Hour Heating and Air Conditioning provides you with major professional equipment items (vacuum pumps & sewer cameras). Modern Mechanical is an equal opportunity employer. Our recruiting and hiring practices are based solely on job-related criteria and we do not discriminate on the basis of any federal, state, or locally protected class. Please note: as a residential services company, we take the reputation of our organization and our employees very seriously. As part of our hiring process, we perform DMV and criminal background checks and substance abuse screening. By completing an application for employment, you are consenting to and authorizing us to perform this step in our hiring process. Get the Ball Rolling – Apply Today! Have you ever been hired under another name? If yes, please describe. Please note: disclosure of your military service is voluntary and not required for this application. We are, however, a veteran-owned business, and therefore offer preferential hiring for people with a history of military service. Our company does DMV pre-employment criminal background checks and drug testing. Is there anything we need to be made aware of? If yes, please describe. Have you ever been convicted or pled guilty or no contest to any criminal offense? If yes, please describe. Do you have residential/commercial HVAC experience? If yes, please describe. Do you have experience as an HVAC installation technician? If yes, please describe. Do you have experience as an HVAC service/maintenance technician? If yes, please describe. Do you have experience as an electrician? If yes, please describe. Do you have experience as a plumber? If yes, please describe. Do you have call center/dispatch experience? If yes, please describe. Please describe previous employment, if applicable. Please include: Job Title/Position; Employer Name, Address, and Phone Number; Starting and Ending Dates; Starting and Ending Pay; Job Duties; Supervisor's name; Supervisor's phone number. Have you attended a trade school? If yes, please describe. Have you attended university/college? If yes, please describe. Do you hold any other certifications? If yes, please describe. Do you have computer skills? If yes, please describe. Do you speak any language(s) other than English fluently? If yes, please describe. How many years have you known Reference 1? How many years have you known Reference 2? How many years have you known Reference 3?